Have you played SwagIQ ? It’s a live trivia game show where you test your knowledge to win cash prizes. It’s free to play, just download the APP to get started. 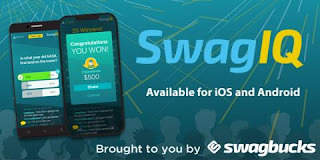 To earn money, you must be a member of SwagBucks. It’s also free to sign up, and there are plenty of ways to get free gifts cards by using the site! Just click on my REFERRAL LINK to get started!